You know the old saying…”Got to make hay while the sun is shining.” Today that what we did. No, we did not actually make hay, it’s November. But we are in a three or four-day warm up period and we are hustling to get the last of the seasonal work done while the sun is shining. Knowing Michigan like I do, I am figuring that this is the last warm up of the 2015 season. The White Oak trees have lost their leaves and quite early this year. I stripped the bed and washed the sheets and mattress pad and put the pillows out in the sunshine to air out. Having been sick with bronchitis I feel an extra strong to air out those pillows. The same with the dog’s bed. I can’t prove that sunshine helps to sterilize our bedding but it sure makes me feel better knowing they were out there baking in the warm sunshine for the day. Two Rhodies free ranges in the leaves behind the blacksmith forge. I have also been planning on emptying, sterilizing and thoroughly washing out the chickens feeders before the long winter ahead. So today I finally got to that chore too. I did one hanging metal feeder today and I will do another one tomorrow. Hopefully Thursday will be warm and sunny as well and I can washout the third one and that chore will be accomplished. 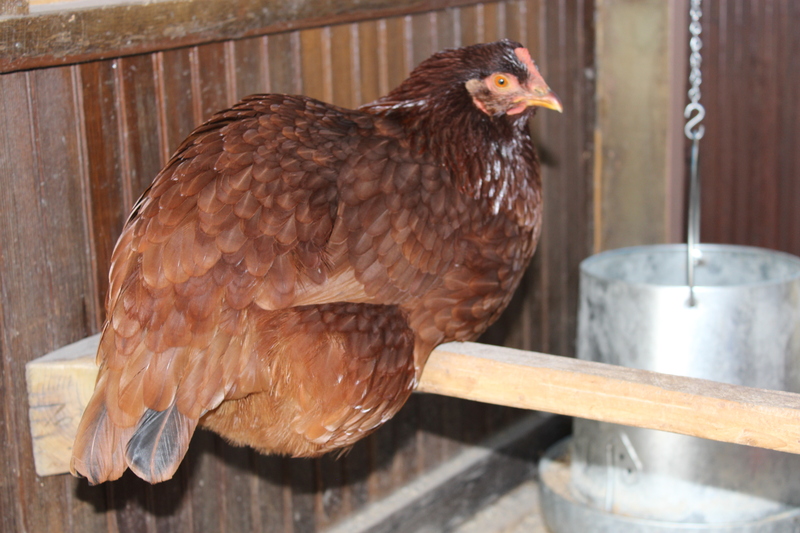 Crystal rests on the roost in our warm Indian Summer we are experiencing. Gene is spending his day draining and putting the hoses away and tackling our big leaf pick up chores. 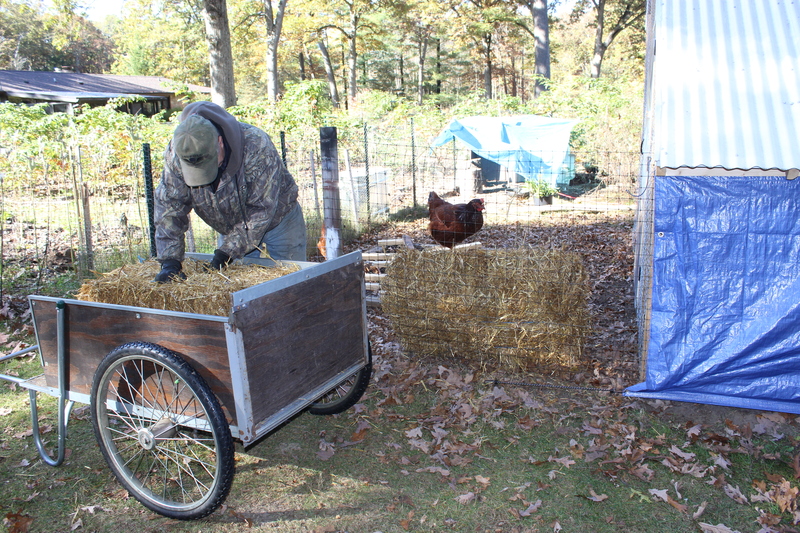 Last week he raked enough leaves to fill up the our three chicken runs with dry oak leaves as well as five large Menard’s leaf bag with leaves to use as coop bedding this winter. 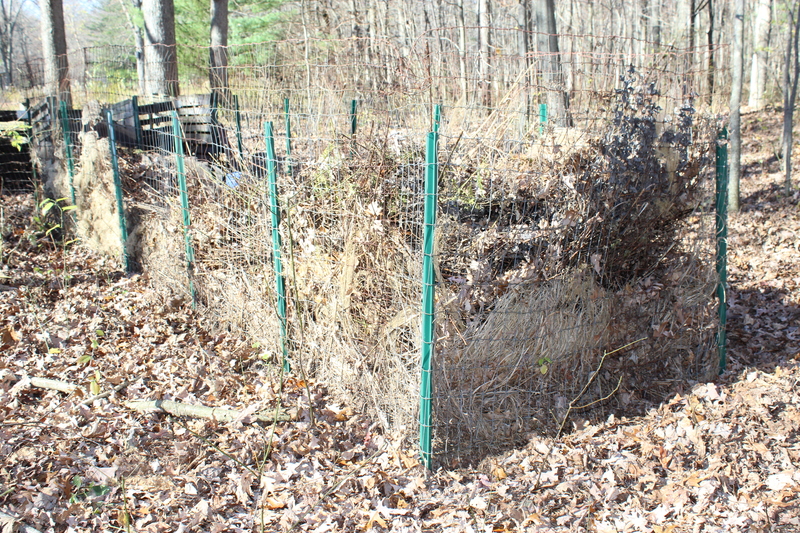 The compost bin for heavier and thicker materials like ornamental grasses. Today he is sucking more oak leaves out of the stone landscape bed around our Ranch-style home. The next two days will be saved for blowing and leaf pickup with the lawn tractor. 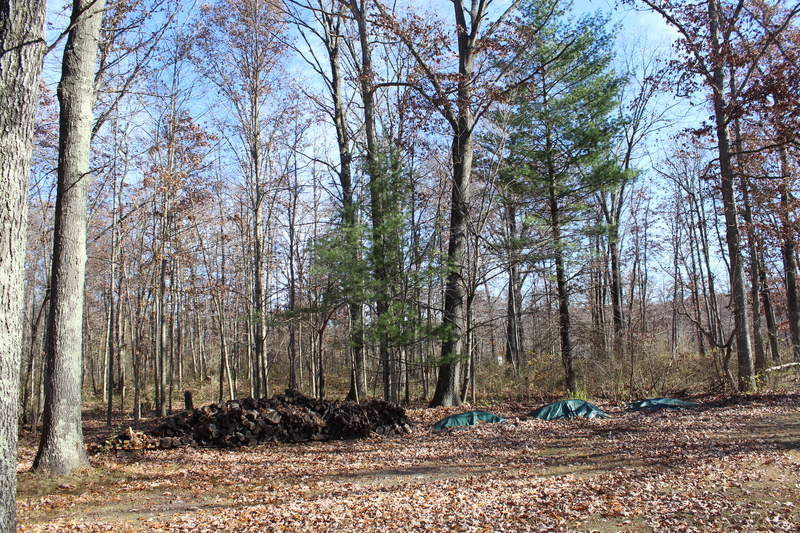 The oaks have pretty much dropped all of their leaves and we are under the gun to get the picked up and distributed on the wood path, along the landscaping beds, in the meadow and so on. He says we did not have nearly as many leaves as we have most summers. By the end of this week that it is supposed to turn cold and to rain heavily. We are praying we can get these final chores done by then. Wish us luck!! Even the Amerigas LP company is working to beat the clock of s-n-o-w! 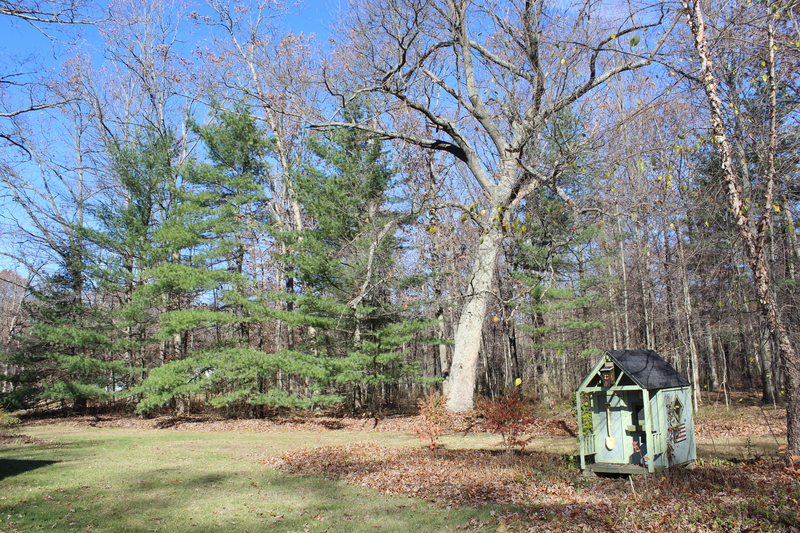 This is the first year the oak branches have been empty of leaves by November 2 – that is VERY early for us here in SW Michigan. 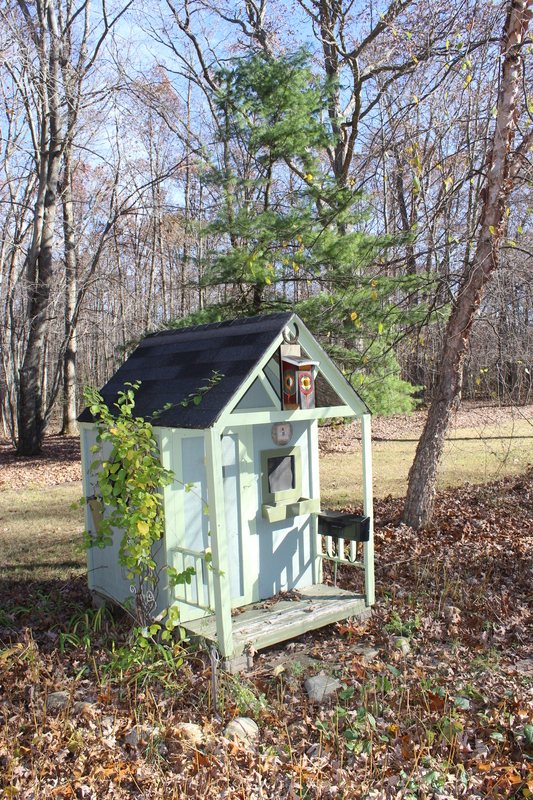 The owl box is up and ready for the schreechers. Today we are having what we always call an Indian Summer. I am not sure if this is politically correct to call this by this name now but this what we always called these late fall days in my childhood. Indian summer is a period of unseasonable warm, dry weather that sometimes occur in autumn in the Northern Hemisphere. Today is sunny and clear and with above normal temperatures. This usually happens late in the season after we have had a killing frost. For us this means a glorious 70 degree in November; sunny and warm! I could have gone to town today with Gene and gone to yoga and run errands but I simply needed to be outside on a day like today. No meetings, no obligations just time to soak up that sunshine and get well! Like taking a kind of mental health day! I hung a load of clothes outside on the line and then I worked outside half of the day, planting, cutting back the Autumn Sedum Joy, supervising the Rhodies at their free range activities. I even I tried raking leaves but this bronchitis has made me weak as a kitten and it was time to quit. I give up. 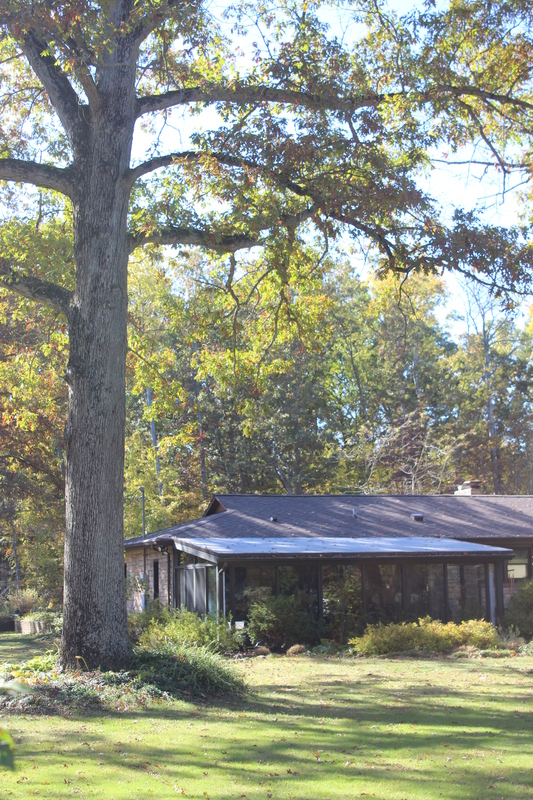 So instead I took photographs of the homestead on this beautiful day. Who would think we would be having a 70 degrees plus day on November 2? November is when the cold and snow arrives in my neck of the woods. A day this warm makes me tempted to go to the beach. I love how this land looks like a very different place this time of year. The meadow is cut down, the leaves are off the oaks baring their beautiful trunks and the evergreens take their turn at standing out in the landscape. 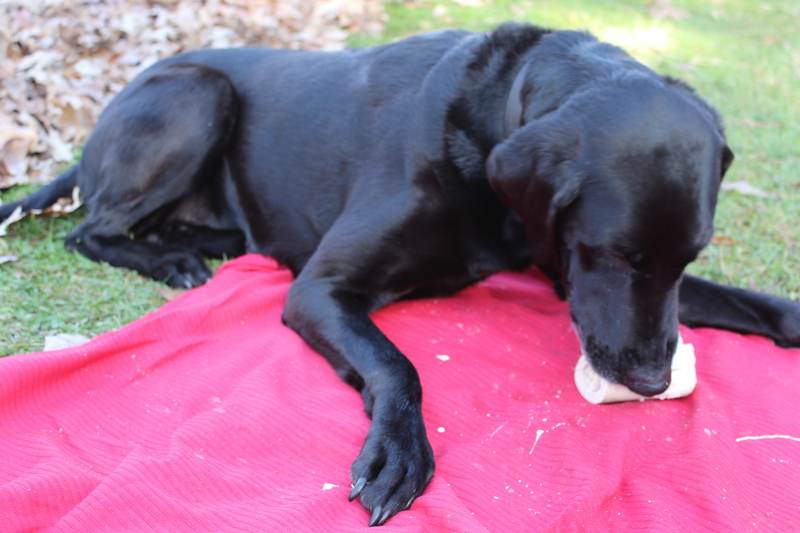 The animals love this weather too; Sassy is out on a blanket chewing on a bone. 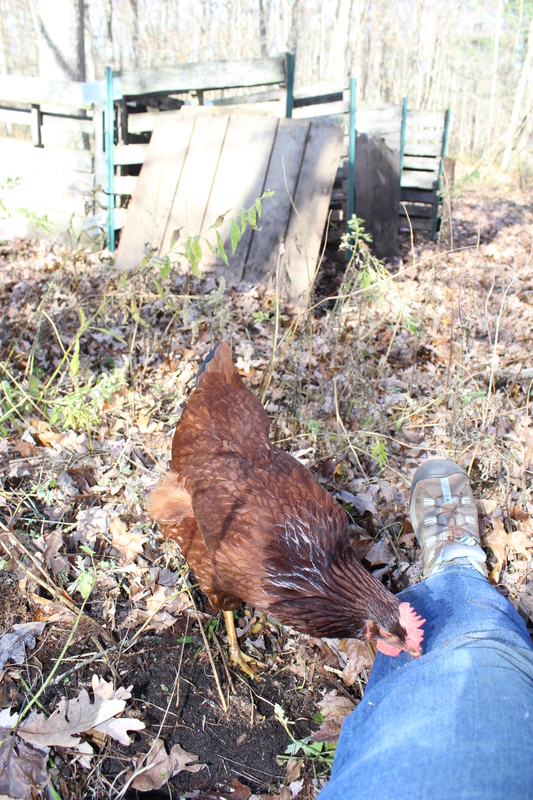 The chickens are free ranging and happy as can be. I’m going to enjoy it while I can because it’s probably just the calm before the storm. So look out Michigan…. the Farmers Almanac says its going to be a colder and snowier winter than usual for us! 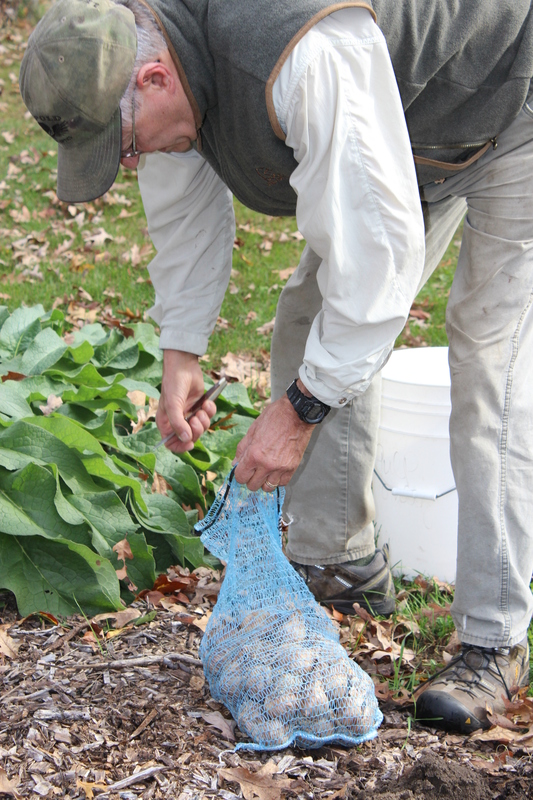 Planting fall bulbs symbolizes hope for another spring. 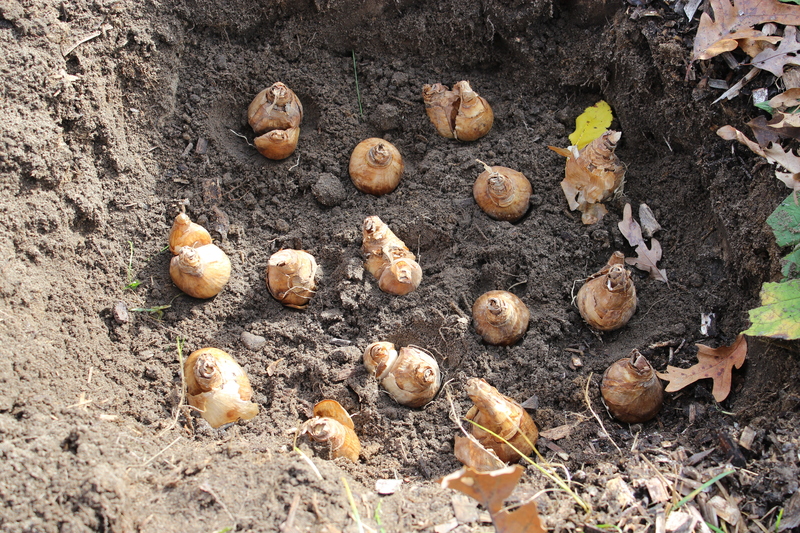 Today I planted 100 Trumpet Daffodil bulbs, a classic all yellow large Daffodil. I have another 100 to plant and will do that soon. 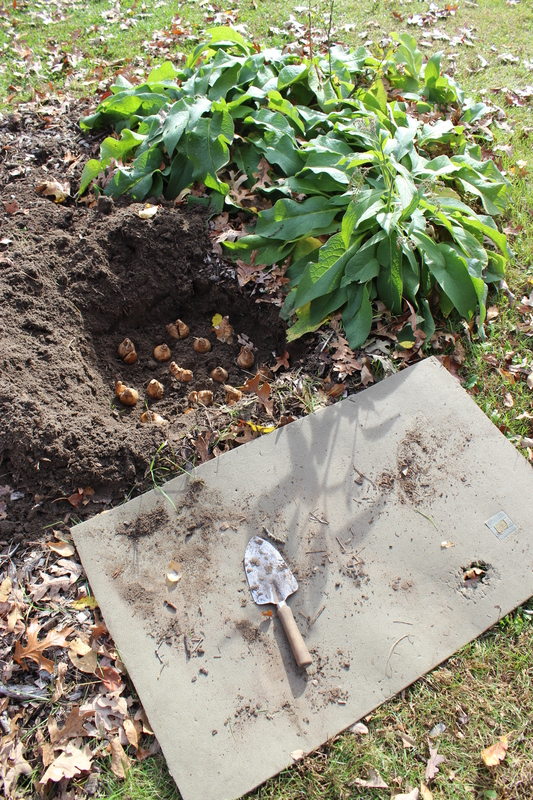 I scooped out soil to make two large circles on the inside of the fruit tree triangle and nestled the bulbs in among the comfrey leaves. Both the comfrey and the daffodils grab nitrogen from the air and makes it available to the fruit tree roots in a symbiotic and perfect relationship. Gene helping me open up the mesh bags. Planting bulb in the fall of the year is such a symbol of hope for me. Hope that these bulbs will live thru our snowy Michigan weather to come alive when the spring sun and rain again heat up the soil. Daffodils are a renewal of the spirit of spring for me. If you are an avid gardener you know that daffodils must be planted in the fall or early winter to bloom in spring because they require a long period of cool temperatures to spark the biochemical process that causes them to flower. In fall, it’s important to get them into the ground before the ground freezes. They need time to develop strong roots. 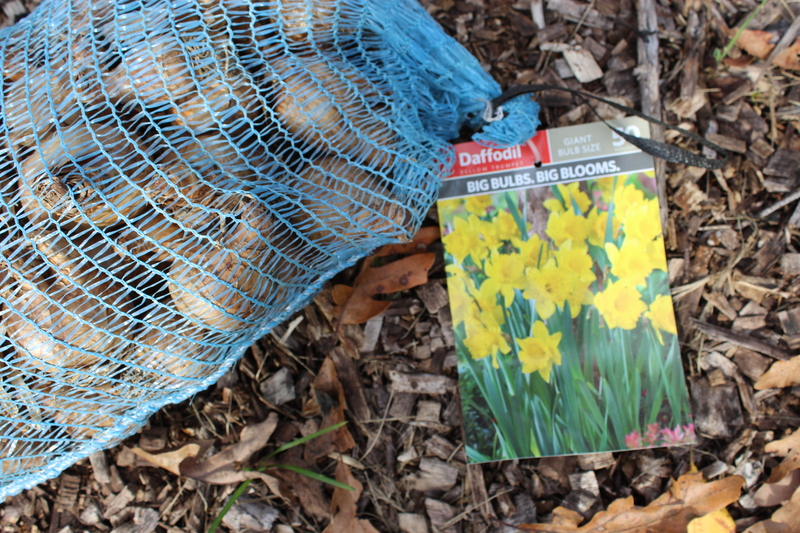 Deer resistant and so easy to grow, these bulbs do really well here in our sandy, well draining and often dry soil. Because we planted our fruit tees just this spring and heavily amended the soil at that time well horse manure compost, straw and bark ships, the digging was easy. Digging the hole in the fruit tree bed for the bulbs. We are supposed to get an inch of rain tonight, so watering them in will be done by Mother Nature this time. I consider these bulbs a good investment because they bring me such joy spring after spring. There is an interesting history and lore that surrounds the daffodil. Daffodils were brought to Britain by the Romans who thought that the sap from daffodils had healing powers. Actually the sap contains crystals that can irritate the skin. Giant bulbs yield large flowers. Greek mythology gives us the term narcissus. There was a young Greek named Narcissus. A nymph called Echo was in love with him, but Narcissus broke off the relationship. Heartbroken she hid in a cave and died. Later Narcissus, who was very handsome and quite taken with himself, saw his face in a pool, and as he leaned over to see better, fell in and drowned and became the flower. Please Don’t Burn Your Leaves, Recycle Them! Today’s post is about a serious SAFETY WARNING. I know lots of people burn leaves to get rid of them and it’s an age-old practice. Please use extreme care though. We experienced a near miss when we unknowingly left a small coal in a pile of sticks after burning an unwanted branch with bugs on it. When we got home from our walk in the woods on a beautiful fall day we found the firefighters saving our meadow and our pole barn. Like many farmers and homesteaders we have a LOT stored in our barn. We would have lost vehicles, a fishing boat and motors, my kayak, Gene’s hunting gear, our lawn tractor and leaf pick up unit and much more. It was scary and could have been a very costly mistake. We have never repeated that mistake again. 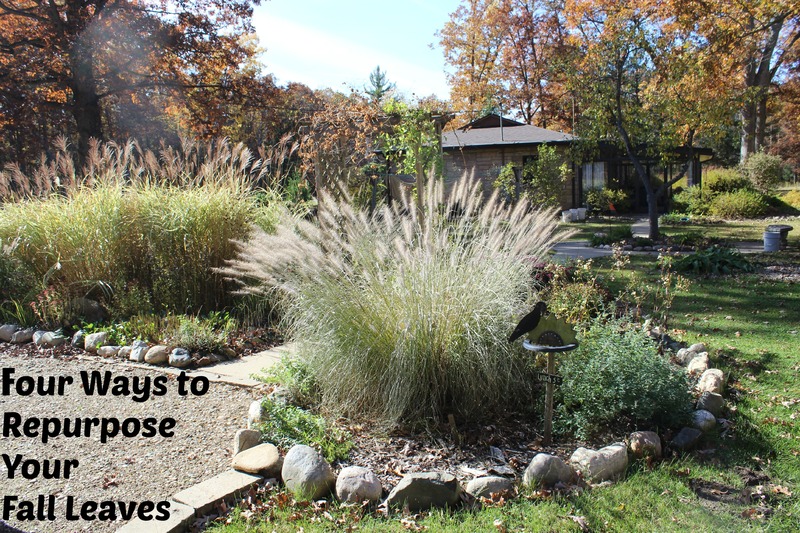 INSTEAD you can opt to use your leaves to make mulch and to make great garden soil. Spread them on your garden beds, on woodland paths or in your chicken coop or even blow them into the edge of your land to keep the weeds down and more. 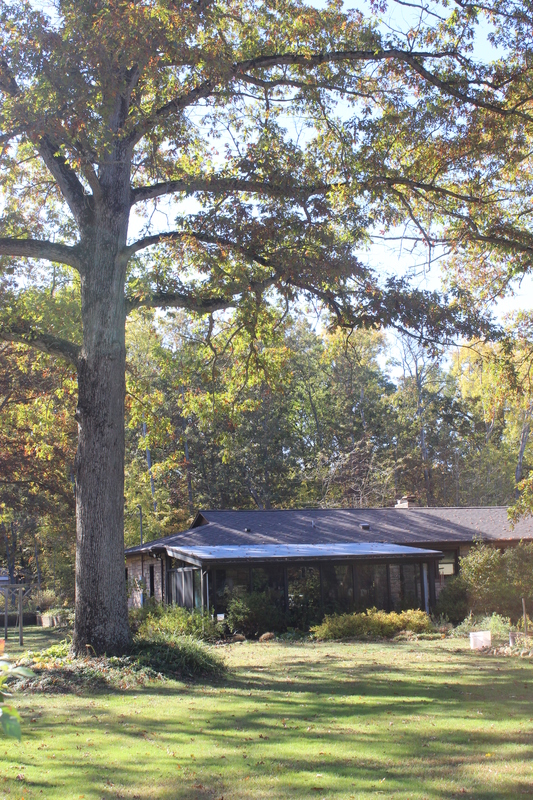 We have 47 White Oak trees here on the homestead and we treasure and recycle every leaf these trees give us. 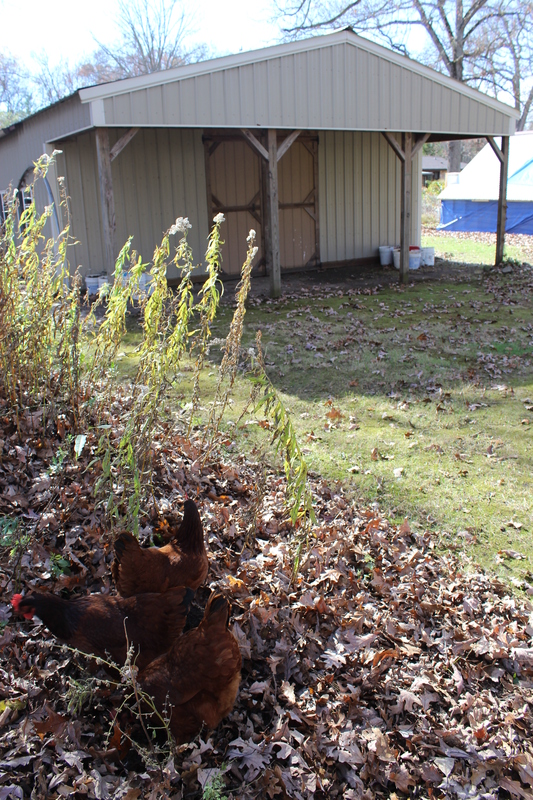 The dry oak leaves are put in the chicken coop as a kind of ground cover and mulch and to keep the mud to a minimum. We haul 10″-12″ inches of leaves onto our wood trail because the leaves help to keep the green briar from taking over the paths. 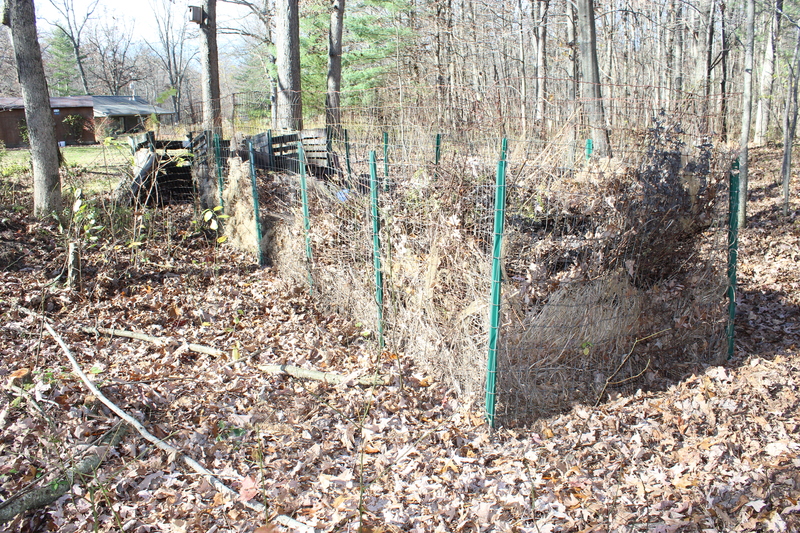 We use them create a barrier in the meadow between the native plants and the grassy weeds. this help to keep the grasses from coming up in the flower garden area. I drop leaves on the paths between the rows in the vegetable garden. This gives me a path to walk on and help to keep the weeds low. We even bring home our son’s Maple leaves from his city home to save him a recycling take away fee. We compost them and turn them into great soil for the beds. I put those Maple leaves directly into the garden on our raised beds and by spring they have almost broken down into glorious garden soil. It’s natures recycling program at its best! The view of the Small House from the back side of our property. 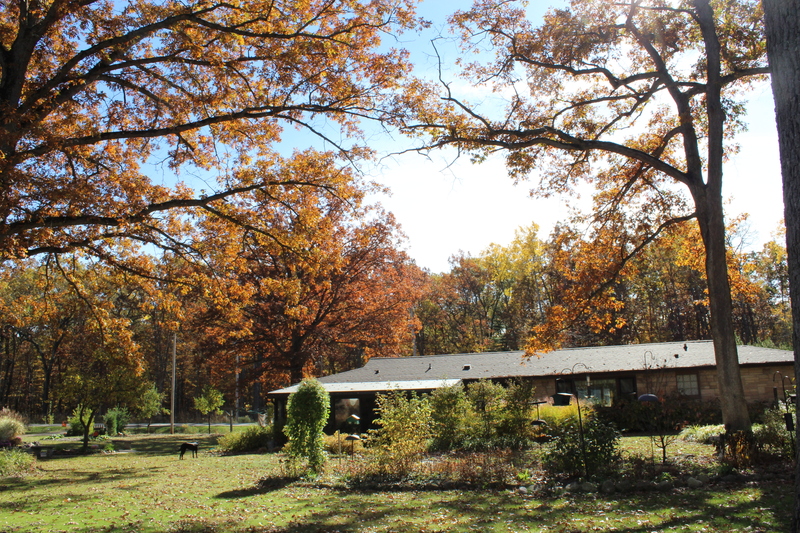 I can’t help but share more of the exquisite fall color we are experiencing here on the homestead. It is simply outstanding this year. The White Oak leaves are now turning brown and dropping. The Maple tree leaves have already turned their bright yellow/orange. The Sassafras leaves are heading towards yellow and the native Dogwood leaves are now a brilliant red. Our local Burning Bushes have sprung into a dazzling pink and the St. John’s Wort’s shrubs are a lovely mix of yellow/green heading towards orange. 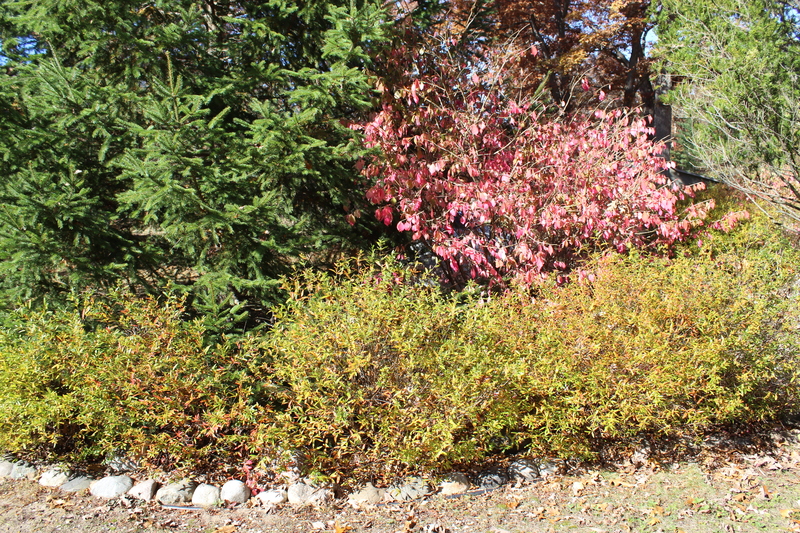 A small landscaped bed in the front of the Small House focus’ on fall color! 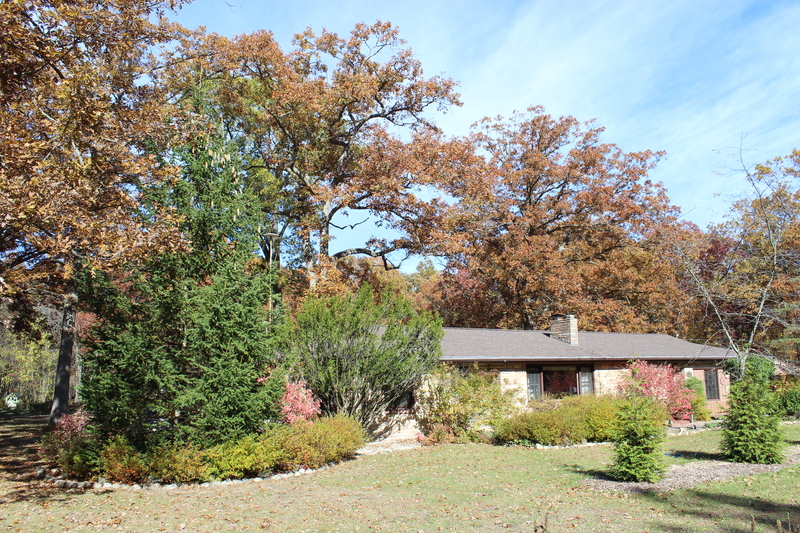 Our property is now surrounded by the most beautiful color-making-autumn and in my opinion, one of the prettiest times of year here on the Small House Homestead. I just can’t spend enough time out-of-doors now. The cleaning, the cooking and organizing just does not matter enough right now. Time enough for that work later on when the snow is blowing. 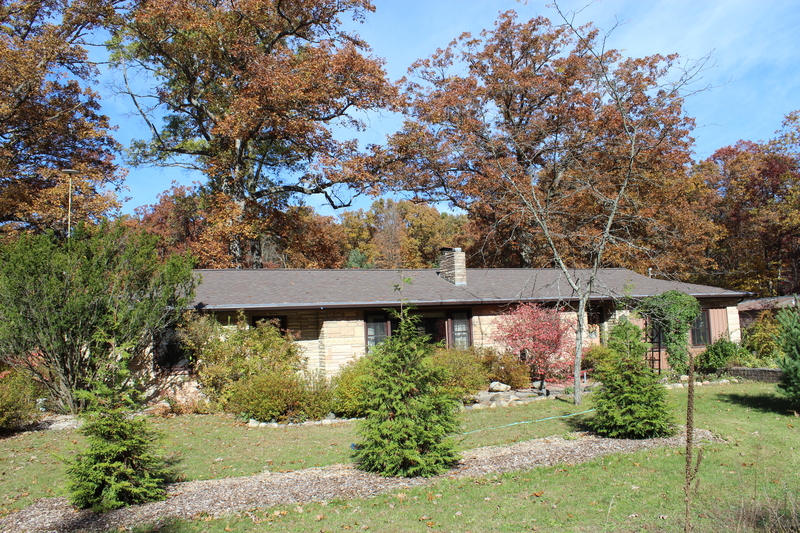 I am standing on the road to capture the front of our Ranch-style home. The past few weeks have been rainy with gray sky period so that meant no blue sky, no sunshine and there no great fall shots! 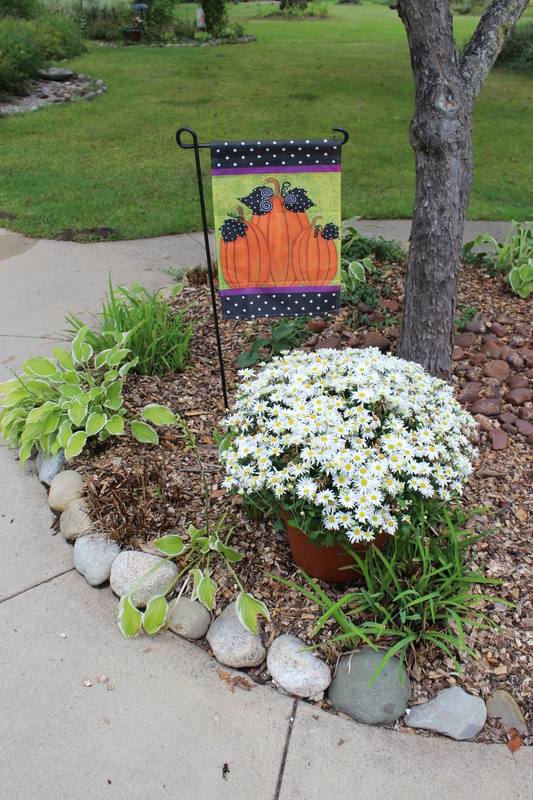 For a while there I had to settle for a vignettes of pumpkins, Halloween flag and the last of the summer flowers. 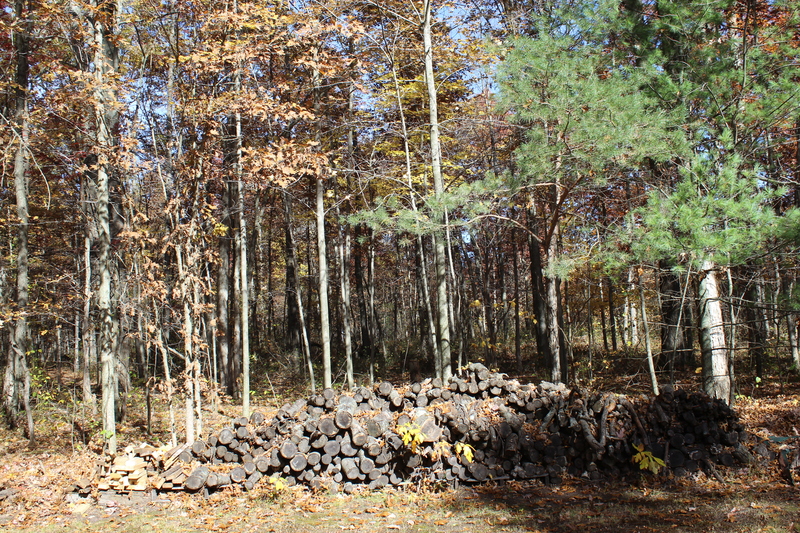 A woodpile stacked up against the wood lot of oaks and pines to the east of our home. 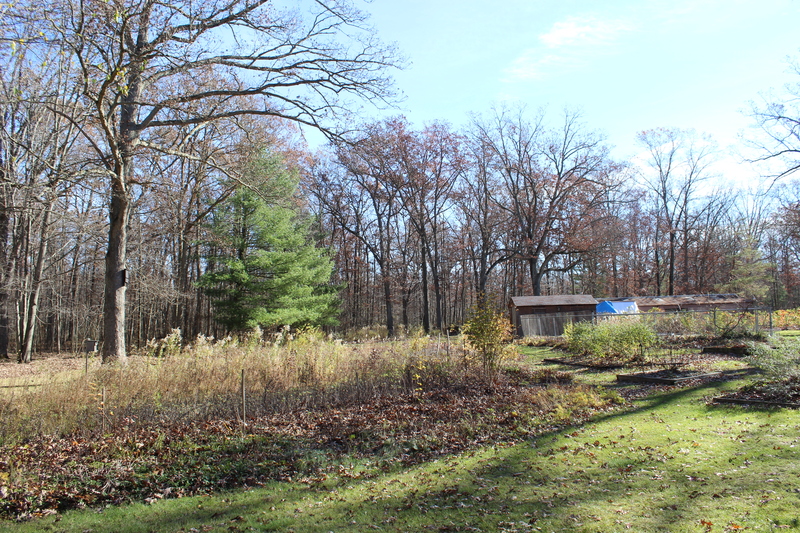 This area features a large cut-back meadow where I had hoped to someday have miniature goats! 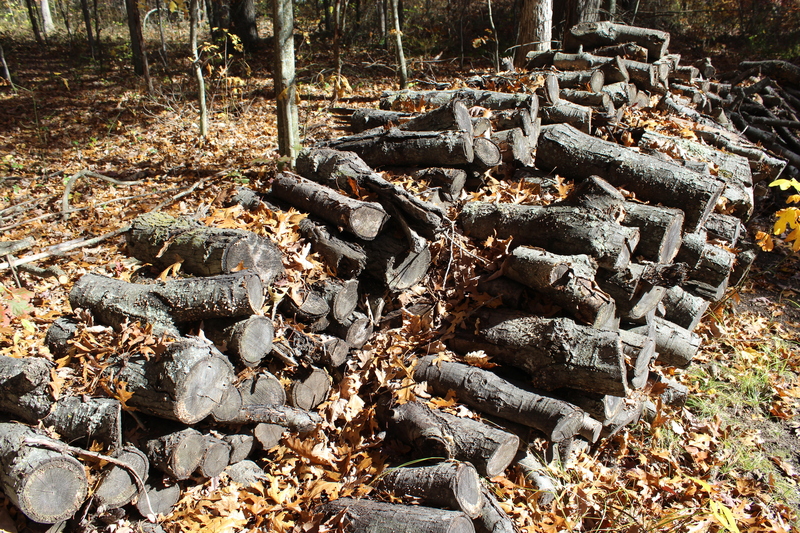 This stack of logs is a current favorite of the chickens to free range in the early evening. But this week the blue sky is back and I am soaking up the sunshine and photographing with a vengeance! 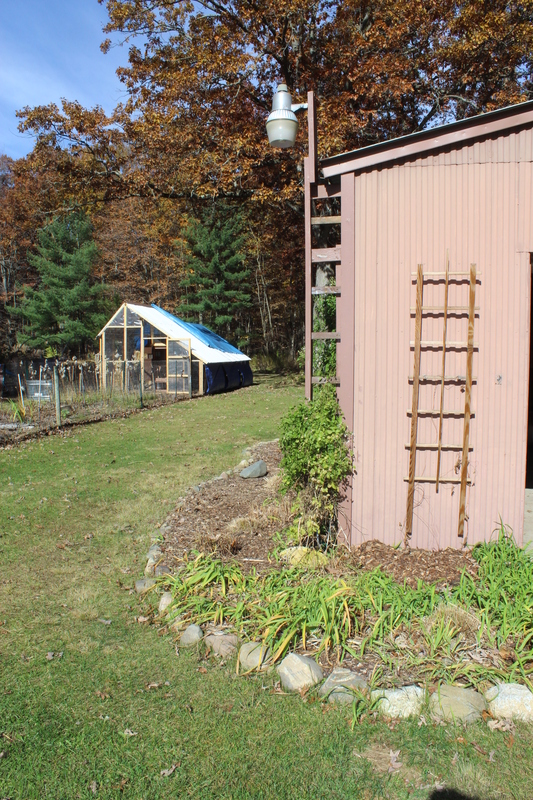 Our pole barn side garden curves back to the chicken coop and run area. Winter is coming in quickly now and we are due for a heavy frost. This means we are powering our way through the rest of the garden clean up chores; putting away anything that might freeze and cleaning out the dead and the dying. 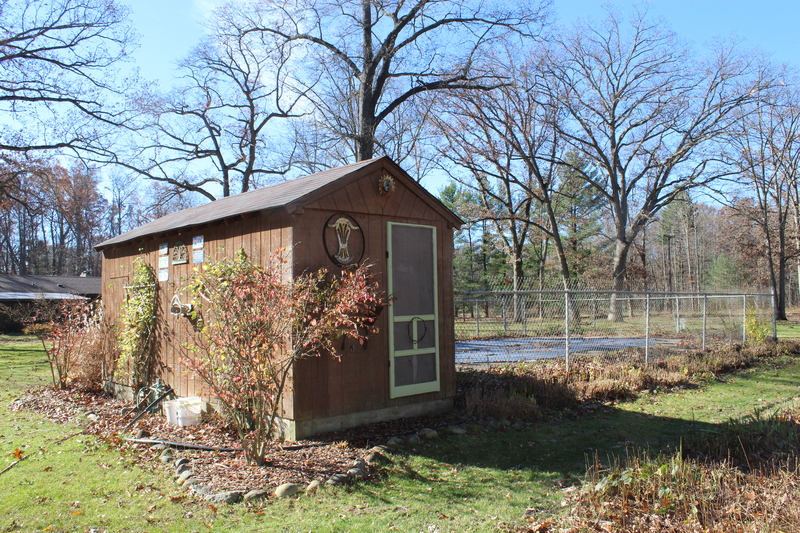 The Rhodies coop inside their protected run soaks up the afternoon sun. The cement chickens were stored in the barn, the metal benches safely stored away as well. We quickly planted 12 burning bush starts today hoping to take advantage of the coming rainfall to nestle them in for the long winter ahead. These starts pop up here and there from our other burning bushes and in the spring I dig them up and pot them up for the summer. I have allowed the overgrown shrubs to stay in order to help buffer our home from the Class AA roadway traffic. Luckily we have the proper large-scale 5-acre property and big open sky that allows this. 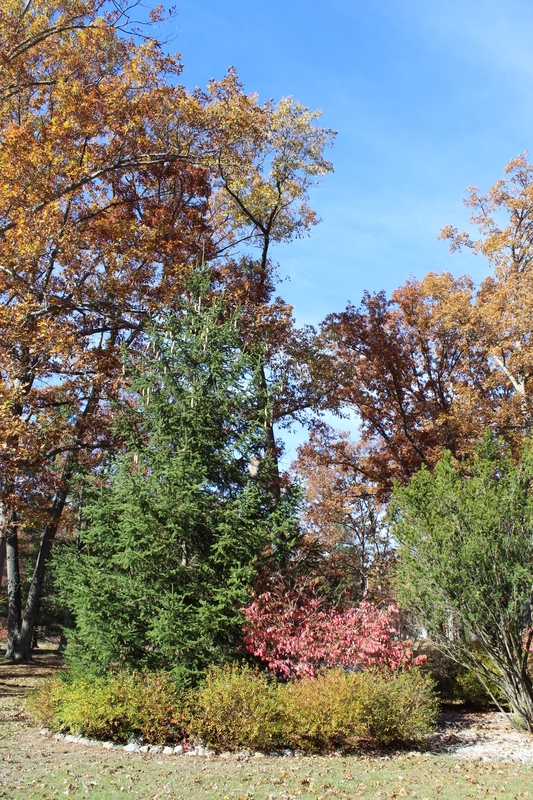 I am trying to create a visual barrier and some more fall color by planting them on the dirt side road where Consumer’s Energy cut down our 23, 75-year-old pines because, they said, they were growing too close to their power lines. You may have read this before but quite frankly I am still mad that an owner before us signed an easement that allows them to come 350 feet on our property and no amount of explanation, questioning or even begging would deter them from cutting down our wind block of tree. 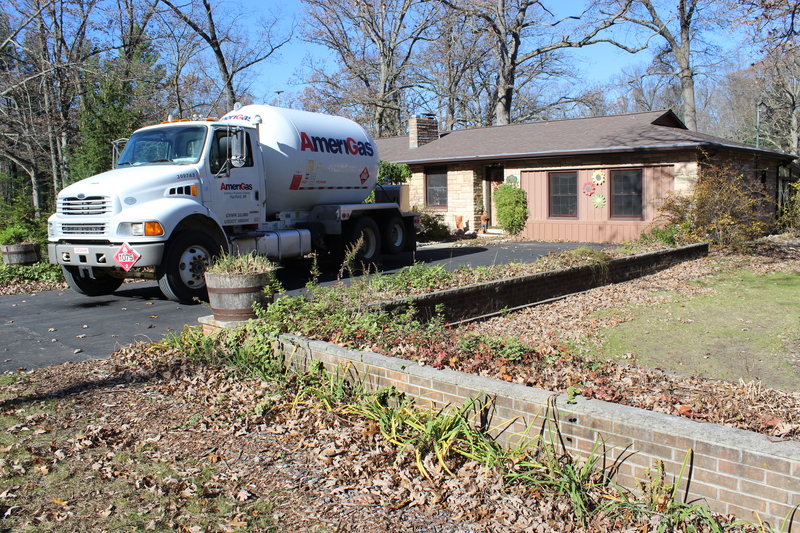 Lesson learned… NEVER ever sign an easement with a corporation. And when buying property make sure you find out if any easements have ever been signed before you close. I hope you are not tired of me saying this…our Small House Under a Big Sky! Please enjoy the autumn wherever you live. I apologize for being so out of touch lately. 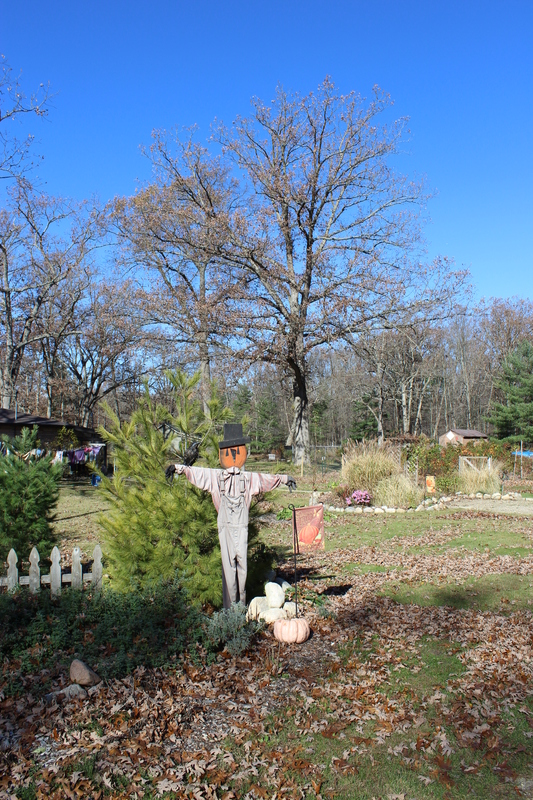 Fall is such a busy time of year for us at The Small House that the outdoor work just takes over our lives. Hopefully I can make up for fewer blog posts of late with some interesting and lively photographs sharing the beauty of our homestead in the autumn. We’ve had a hard frost already here in SW Michigan. Hard enough that it froze my remaining potted annuals and tender hydrangeas but once again the weather has turned warm. In these parts we call these warm days, our Indian Summer. I am enjoying the warm sunshine as are our animals who love to lay in the warm dirt and dust or nap. Our small house under the big SW Michigan sky. The surrounding woods are taking on new shades of reds, yellow and amber thanks to the cooler nights. There is a vivid beauty about the countryside now that stirs my soul. 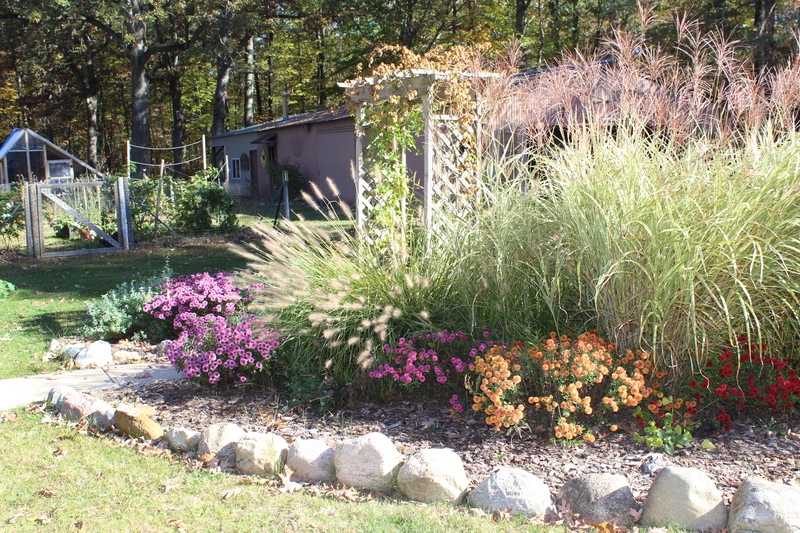 This bed, with its ornamental grasses and mum’s really shines in the Autumn. 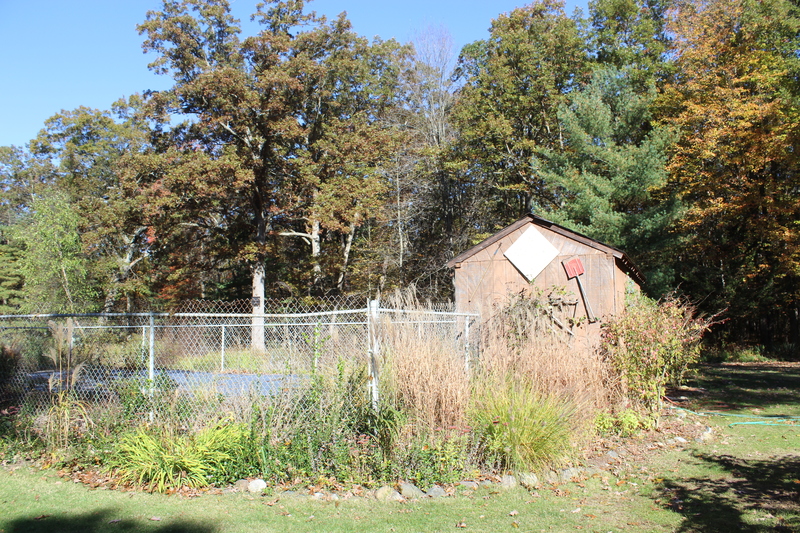 As those of you who homestead know; this time of is year we call “The Crunch Time” or “The Fall Rush.” I imagine that you are working as hard as we are to gather the last of the vegetable harvest, to close down the gardens and get the animals and their pens ready for winter. These seasonal chores plus my plantar fasciitis, physical therapy and various doctor’s appointments have kept me on the run. While I honestly prefer a more home-center, slower-paced way of life, I know I must take care of my health right now and that means many appointments in town and twice-weekly working out. 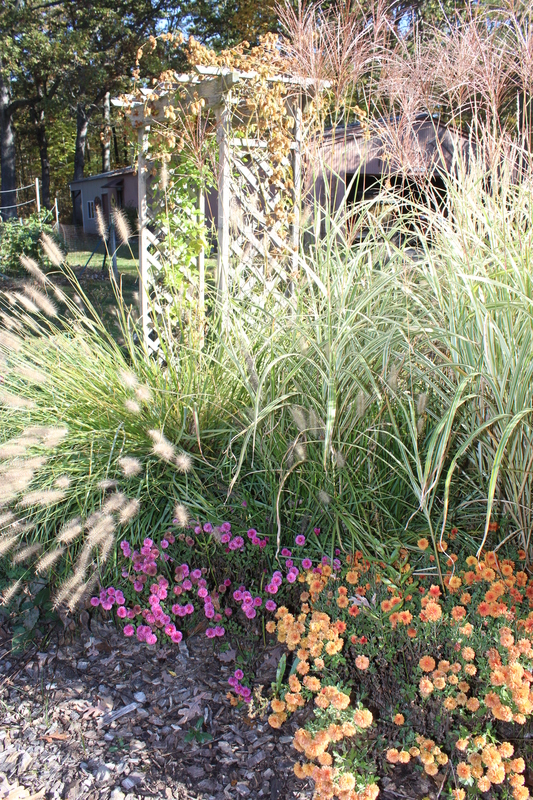 The billowing and blowing grasses are among my favorite native perennials. The fruits of our labor can be enjoyed in our perennial gardens right now. 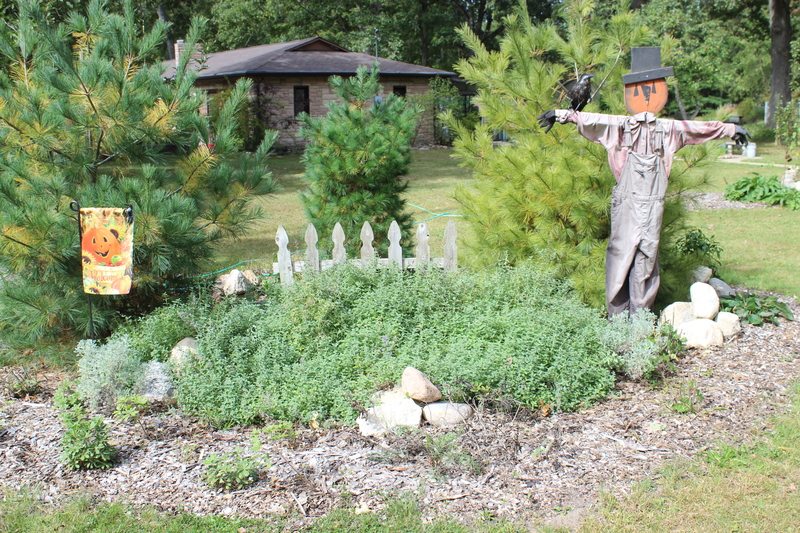 Native perennial plant, stones hauled home from farmers fields and roadside ditches, mingle with my carefully chosen plantings and projects all lovingly built and maintained, that shine during the Michigan fall. I enjoy every season here but if I had to choose my favorite, I think it would be autumn. 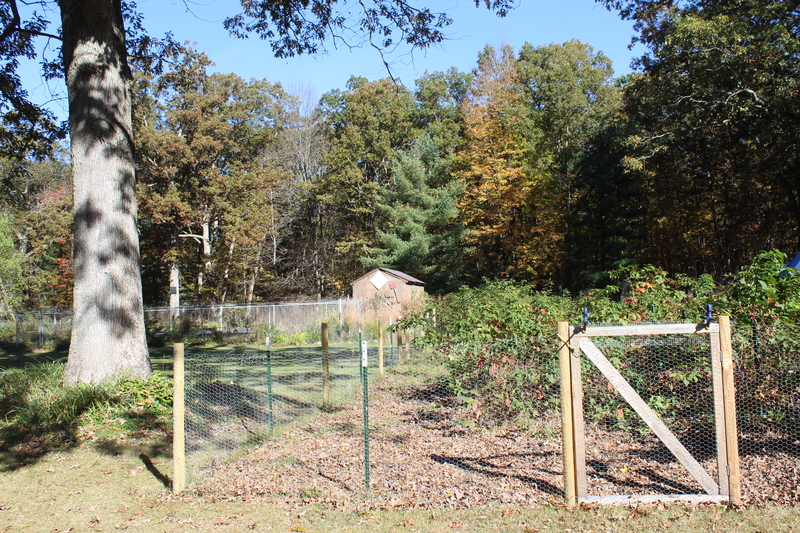 The fenced-in black raspberry patch is one of our chicken’s favorite runs. 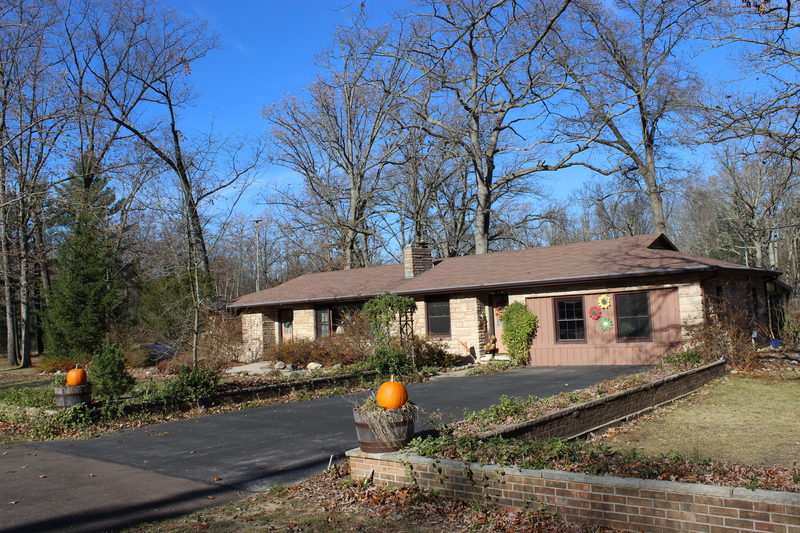 Here is a peek at the Small House Homestead this week in all of our lovely fall glory. 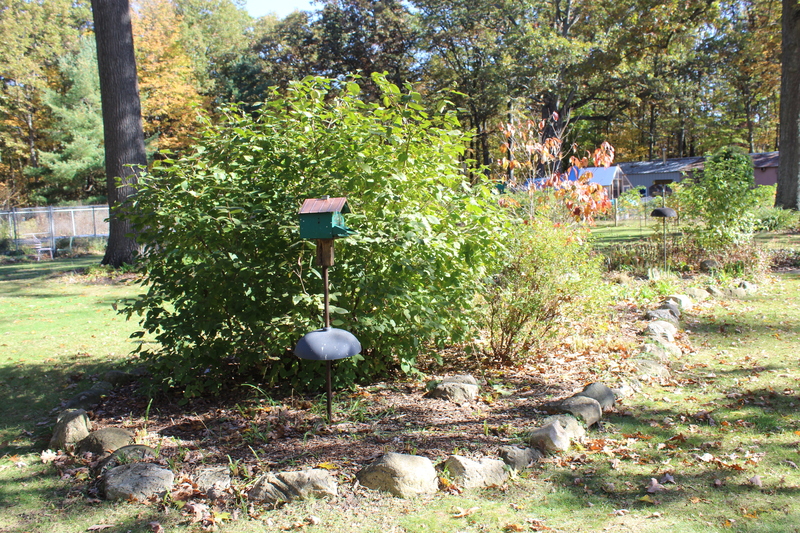 Shrubs and feeders provide food and shelter for our beloved songbirds. Our non-working in-the-ground pool resides nestles up against the forest edge. 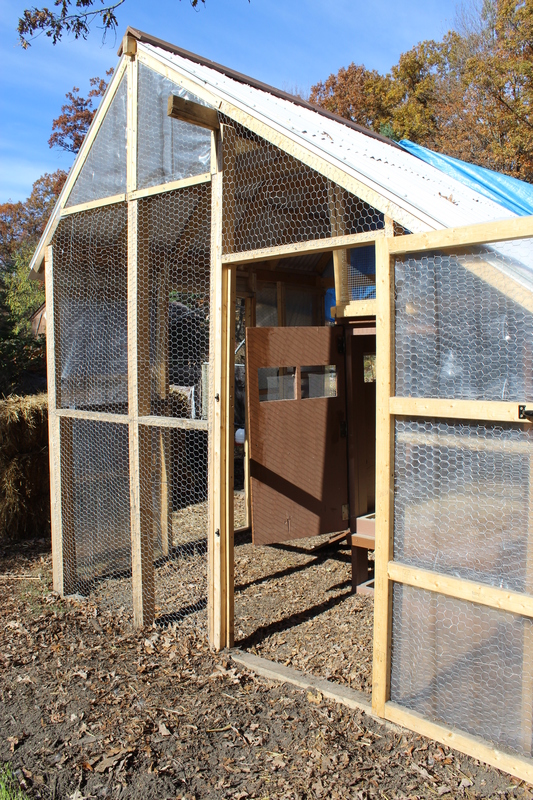 Bales of hay will block the winter winds to the chicken run and coop areas. Then next spring these bales will be broken down for mulch in the garden. 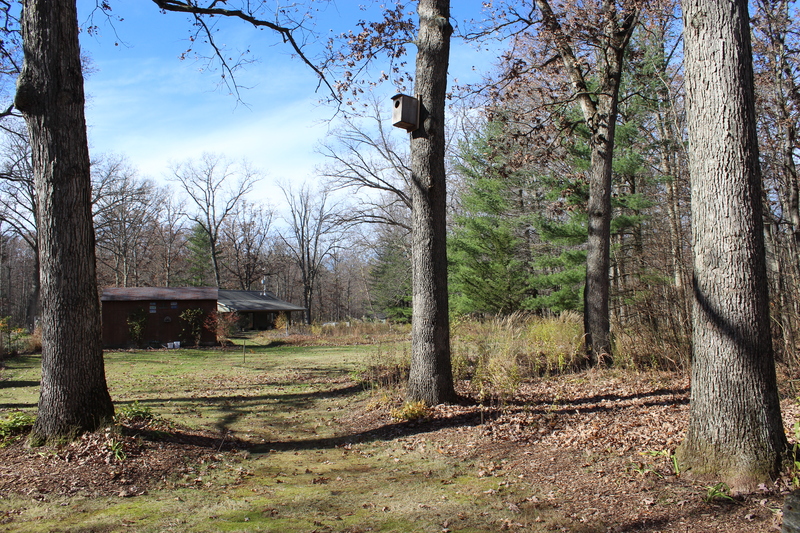 The chicken condo complex is nestled under our majestic White Oak trees. 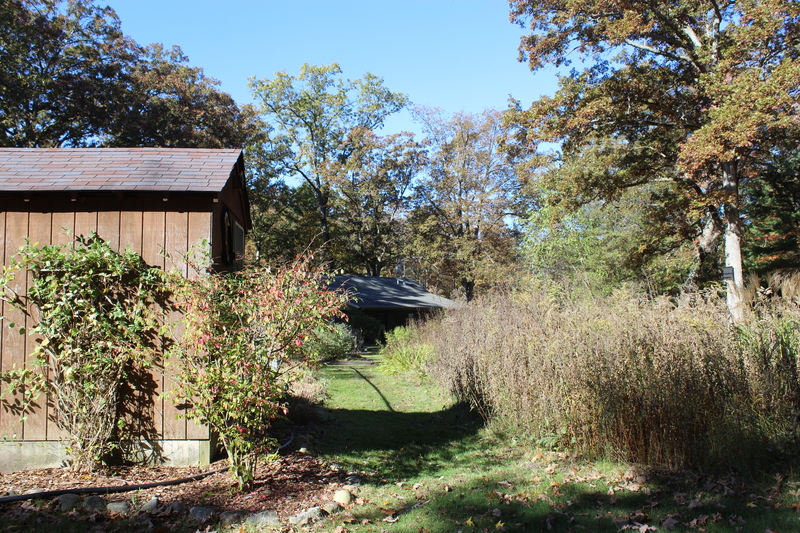 The pool shack, meadow grasses and the wood lot in late October. 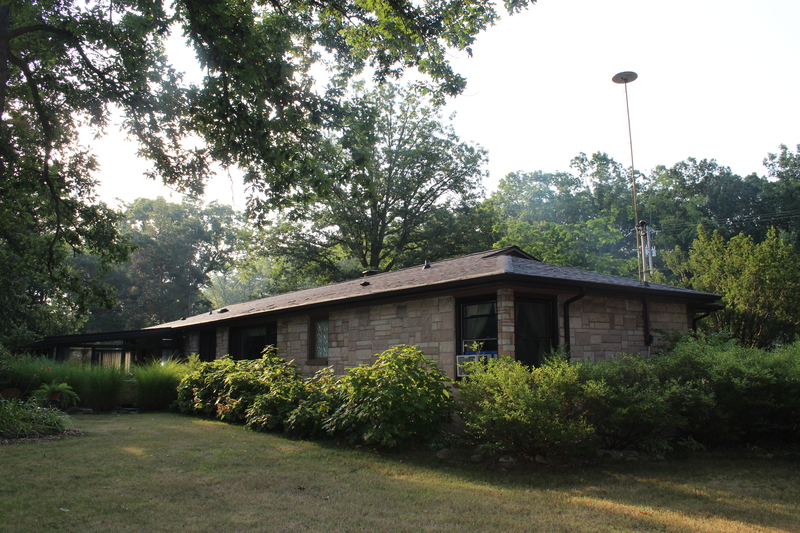 Our 1950’s era ranch-style home. Yes, that is an old-fashioned TV antenna not a UFO! The pool shack storage shed with our home in the distance. 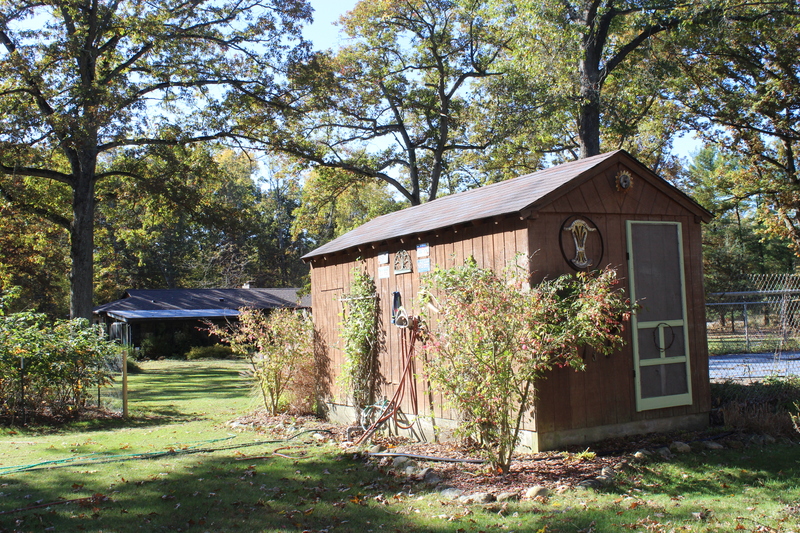 The pool complex, storage shack and garden. 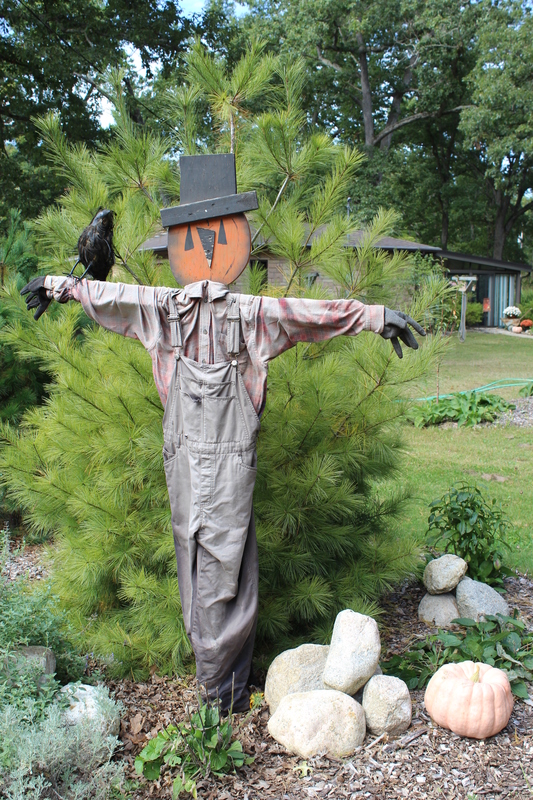 I hope you enjoyed you enjoyed a taste of fall on our homestead. We took a few minutes this week to make our pole barn driveway a bit more welcoming for friends and family. 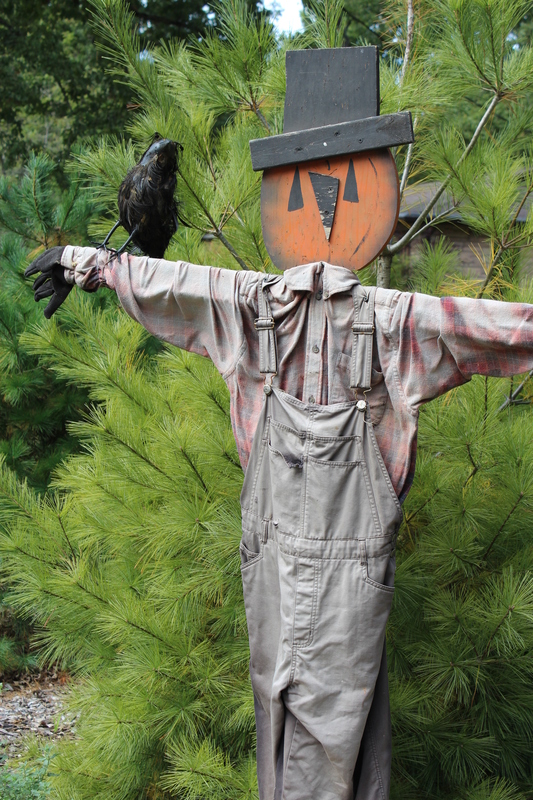 We put out our painted scarecrow to give our yard a bid of seasonal piazza. This guy always gives me a boost! This is the flower bed at our driveway that greets our visitors. I love to decorate for the season but this year I have been so busy that it has just not happened. 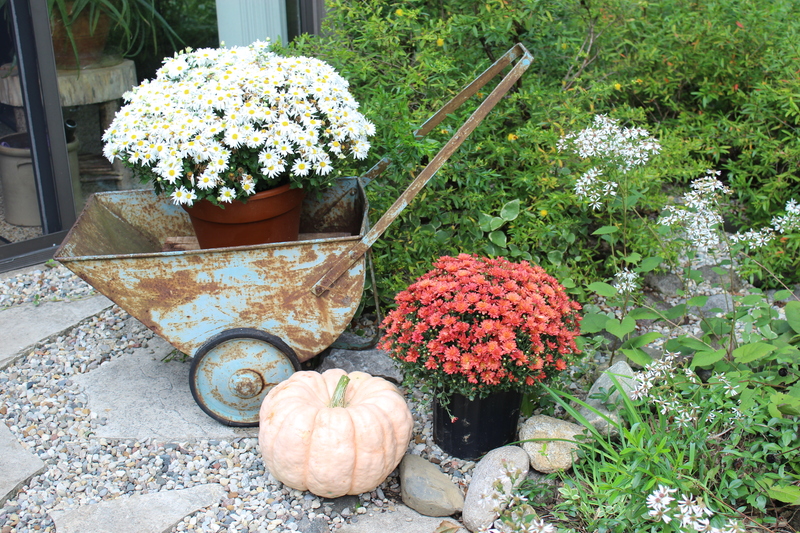 A few colorful mum’s, a vintage rusty wheel barrel and our scarecrow will be it for this year.